It’s time to finally put aside the top-knot hairstyle that has gotten all of us through both good and bad hair days. This season, many new hair trends could satisfy our top-knot needs. If you’re looking for some hairstyles that could make your life a little easier or freshen up your “look playbook,” consider these trends instead of that tired top-knot. This look is as effortless as the top-knot, and you can manage to look like you have your hair (and your life) together with a simple bow. 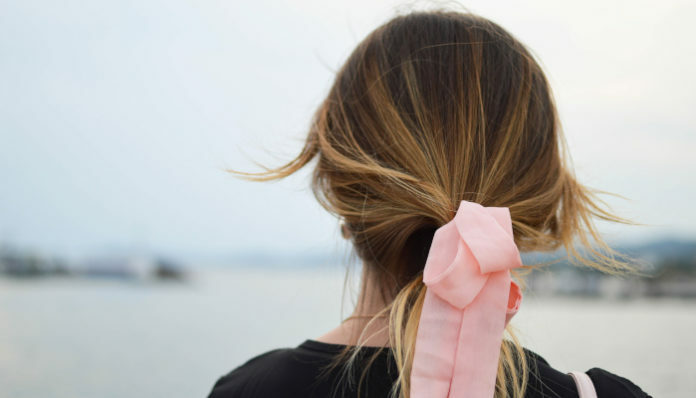 All you need to do add a pretty ribbon on your ponytail or half-updo. You’ll look like you just finished eating at a picnic or taking a stroll down the Paris streets. DIY Tip: To avoid the overpriced ribbons sold in stores, you can hit your local craft store and buy the ribbon of your choice. What better way to put your top-knot to rest than by chopping it shorter? With less hair, you spend less time worrying about your locks. An effortless, angular bob could be the perfect solution to your everyday routine. You can style it sleek or wavy, so it’s an excellent fit for any occasion. Fringe is the latest style, and celebrities from Selena Gomez to Zendaya have rocked this sleek look this year. You can style your fringe as you please, and it works well for any hair texture. Pro Tip: To get your bangs to stay in place without them looking hard, use a dry shampoo instead of hairspray. Are you looking for something a bit more chic for a meeting or school presentation? Try a simple, but sophisticated braid. A braid will give you the peace of mind that your hair will stay in place all day. Instead of a top-knot, try a bottom-knot! Do up a messy lower bun, and channel your inner Meghan Markle. You can pull some hairs to the front to get that effortlessly tousled look or make tiny braids and pull them out of your way for the not-so-great hair days. These hairstyles might not completely take over your well-loved top-knot hairstyle, but they quickly add a unique touch to your daily hair routine. You never know; one of these styles might save you from a bad hair day!